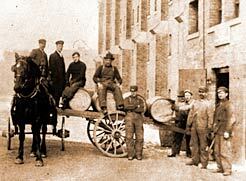 To feed his cattle at the corner of Walker and Tecumseh, Hiram Walker laid a slop pipe from his distillery on the riverfront. The pipe was constructed of hollowed out cypress trees imported from the Florida Everglades. The cattle were well fed with the pumped in leftovers for many years. When development caught up to the cattle yard, the livestock were moved and the pipe was abandoned. Occasionally, bits of it turn up: sections were found on Monmouth Rd. and at the GM Transmission Plant. You can view pieces at the Windsor Community Museum and at Hiram Walker's. Due to the Civil War, in 1864, a loonie was worth $2.50 U.S. Hiram Walker purchased as many U.S. dollars as he could. Demand for alcohol was so great his distillery was busy loading whiskey into boats headed for thirsty Americans. By the time the war ended and the U.S. dollar returned to par, he was rich. Walker's success made competitors jealous; from a place called "Swill Point" in Detroit, a concocted story emerged that in order to avoid customs, he had constructed a whisky pipeline under the river from his distillery to his Detroit property at 35 Atwater St.